For many people, the holiday season is the high point of their year. However, some people tend to dread the thought of holidays coming because they more likely to gain some weight during the holidays. Not giving in to the temptation of limitless wining and dining during the holiday season can require a tremendous amount of willpower. Since holidays offer a large number of opportunities for overeating and indulging in high calorie foods, we often forgo the sensible routines and dive in. It can seem like an endless celebration with lots of desserts, lunches with delicious food and great company, afternoon naps on days off, huge family dinners and lots of wine and spirits. The overindulgence of food will certainly provoke weight gain and can take a toll on your body as well (high sodium, high sugar foods). Fortunately, it is possible to avoid holiday weight gain and still enjoy yourself during holidays. That’s key, because no one should feel deprived during this time. Yes, you will want to partake in the holiday meals and treats as part of the festivities, but if you have a little snack or small meal before the actual lunch/dinner/get-together, you will likely eat significantly less food. With a half-filled stomach, you are more likely to resist the temptation of overeating easier and be able to focus on conversation and general socializing more so than just food. If you forgot to have a snack before the big meal, you can always have two or three cups of water before you begin eating and that will help curb your appetite as well. Explore all of the other fun activities you can do at the holiday party or family gathering besides eating and drinking. It’s a social event, likely filled with people you don’t see as often as you’d like to. Have a conversation with everyone and get caught up. Watch others as they engage. Organize activities or games, play with children, or put on some music and dance. Not only will it strengthen your connection to your friends or family members, but it will divert your mind from all the food and help you prevent eating too much. Some people try to control their intake of food by limiting the time they spend eating each meal, but this doesn’t necessarily work all of the time. Eating your meal in a hurry is not the best way to go, especially in terms of your digestion. It is much more prudent to pace yourself and stay longer at the table. Concentrate on eating slower and chewing your food more. Pause after each bite and really enjoy the taste of the food, savoring the meal slowly one bite at a time. Another option is taking a sip of water after every bite, as this will slow your pace down and help fill you up a little bit quicker. Eating is very much a habit. You get used to a certain pace and just go through with it automatically. If you take your time and concentrate on slowing down, you’ll feel more in control and the moment you begin to feel full, it’s time to stop eating. You may even want to try stopping when you feel 90% full. With time, this tip can help you retain your brain about savoring your meals and you’ll feel more satisfied. We all know that it is quite helpful to implement some sort of regular exercise in your life, especially when it comes to weight loss. Whether it’s walking, yoga in the morning or a full gym training session, exercise keeps will help your body burn those extra calories during the holidays. It may also help curb your appetite and cause you to reach for healthier foods. You may quite busy during the holidays and lots of things may be competing for your time, but don’t abandon your workouts. There are lots of mobile apps that will help you count calories so that you can do your best at staying under your maximum amount of caloric intake per day. Simply log in the foods you are eating into the app and it will keep track and tally them up for you. Many times people don’t realize just how much they are eating during the holidays with plenty of snacks and good food around. This is an excellent way to monitor how much you’re eating and can help you avoid holiday weight gain. Recording your calories does take that extra step, but it’s worth it. 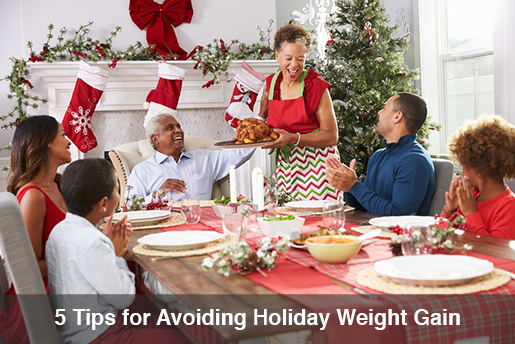 Eating more during the holiday seasons may seem inevitable, but if you go into the holidays with a plan, you’re more apt to avoid holiday weight gain. If you incorporate these tips, you will likely stay on track with your weight loss goals or at least stay at your current weight. If you find yourself healthier, leaner, and in a better condition after the holidays, that is a major accomplishment. Don’t take a 2 month break in Nov and Dec. Your weight loss and lifestyle goals are still important. Make a commitment today to spend your holidays eating healthy and avoiding weight gain. What’s the Cause of Menstrual Cycle Weight Gain?